Hi! If you are new to Black Ink, you're in the right place ! Let's begin the tour by the upper left corner. Just Below the standard menus you can see a set of navigation tools to move your picture around when you draw. They have some options that open when you place the cursor over them and their keyboard shortcuts are "q" for zoom, space for pan and "r" for rotation. They work by keeping the key pressed and moving the mouse. When you're done, just release the key. In the upper right we can see a set of default brushes. They are the calligraphic pencil, the felt pen, the "crepe" and the "volute". Try them out, they each have a very different aspect. Next to them is the eraser tool, you can activate it using the "e" key and come back to the previously selected brush with the "b" key. Just below them is a small picture of a brush stroke. If you start drawing and changing a brush setting, like the size for example, you will see that this actually is a list filling itself with your different settings. This is called the brush history and it's very useful. You just have to select one of your previous settings to instantly call it back and use it again. Next up is the brush preview area, it displays a default brush stroke that instantly reflects every change you make in your settings. 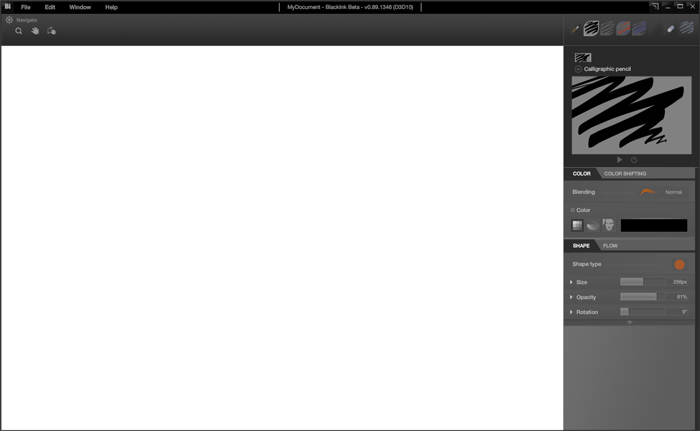 Try and change the size or the opacity, you will see the preview update. The stroke itself can be replaced by simply drawing in that area and there is a button just bellow to restore the default one. And then we have the brush parameters. There are four different tabs. Color, Color Shifting, Shape and Flow. In the color area, simply click on the big box to select a new color. Notice that once you changed colors, a history appears above it. Just like the brushes, you can instantly recall the previous colors you used. There are three color modes : Solid, Gradient and Image-Based. The last two are very interesting and powerful tools and will have their own dedicated tutorial. 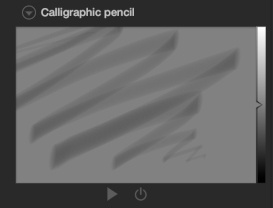 The "Blending" button above changes the way the color is applied when you draw. Try the different settings and if you don't see anything, just set it back to "Normal". In the shape section are your typical brush settings. There is size, opacity and rotation. The "crepe" brush has more specific ones to control the size of the squares. If you click on the small arrow below them, you'll see too other more advanced parameters, Scale X and Scale Y. We will use them later for advanced brush customization. The "Shape type" button changes the shape used to create the brush stroke. This is a great tool to completely change the aspect of our brush. In the Color Shifting tab, you can apply color adjustments to a picked color, we'll talk about this tool in the Image-Based Color tutorial. And finally in the Flow tab is a parameter that sets the distance between the shapes composing the stroke, with that you can make separated dots instead of a full stroke. Now that we have seen the main parts of our working screen, let's talk about one last important thing: the sliders. They are used to change size and opacity and all kinds of parameters so understanding how they work is very important. The one thing to know is that they have to states : simple and extended. To extend a slider, click on the small arrow next to it. So what's the difference between those two states? In the extended version of a slider, you can set a minimum and a maximum value. That's because you often want a value to change according to certain rules. For example, when the size is set to follow your tablet's pressure, the minimum would be the size when you don't press at all and the maximum would be the size when you press harder. Now when you collapse your slider back to the simple version, the changes you make will keep that relative range and apply it to higher or smaller values. So basically, the extended slider is used to set the range of your value, and the simple one is quicker to adjust the final result. The extended sliders have default maximum values but if it's not enough for your setting, you can drag the number and change their range. And that's it for our first look at Black Ink. Try the different default brushes, tweak the basic parameters and have fun drawing !